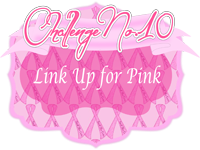 Hi, I am back once more to post a card for Link Up for Pink Challenge 10. I created a Birthday card and thought we could kick up our heels and celebrate for many, many more to come. So here is my little "Betty Sue" getting the party going. I hope you enjoy and it makes you smile. I think she is a real doll. The image is from Artist Heather Valentin and her name is Sweet Betty Sue. The paper is from my stash, as well as the border punched strip. The pleated ribbon is from Really Reasonable Ribbon and the flowers were from Michael's. 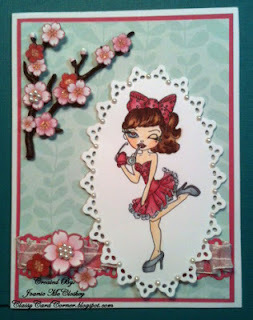 I used Copic markers to color the image and the Oval die cut is from Life Style Crafts. I added small pearls around the edge of the oval. So that's it for now and I will be posting again in a few days. Stunning flowers with the pearls. Such a pretty card! Gorgeous flowers Joanie!! So pretty! WE LOVE YOU ! ! !